This series is made up of children’s stories with a message. They deal with various feelings and emotions. The end of each book offers next steps including discussion and comprehension questions, an activity regarding the specific feeling (i.e. I am afraid of …, I could be brave by …) and an art activity. I enjoyed the stories as did my grandchildren. These are the three latest in the series. 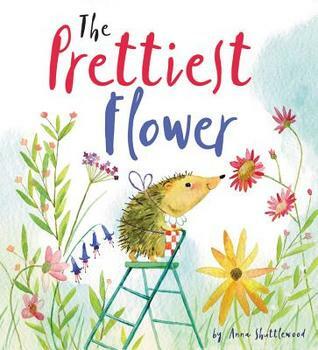 The Prettiest Flower is a beautifully illustrated story about a hedgehog who loves her garden. She works hard to grow various plants and is upset when she wakes up several mornings to see her garden destroyed. She runs around blaming various friends for its destruction, but she is not correct. By setting a trap Hedgehog is able to determine who the culprit is, but what to do about it? There are so many topics this book could be used for. Learning about plants (the names of the plants are in the illustrations) as well as gardening would be a good science theme. Of course, life cycles can be discussed when caterpillar disappears and comes back as a butterfly. Then we have the mystery aspect. Coming up with a hypothesis and determining how to find out if it is correct, making predictions, and drawing conclusions will develop critical thinking skills. Of course there is also the character development topics of hard work, compromise, jumping to conclusions, trust and friendship as well as dealing with anger. As you can tell, as a retired teacher, I love this book and will be recommending it to my friends who teach kindergarten and primary grades, as well as to families with young children. The publisher, QEB Publishing, generously provided me with a copy of this book upon request. The rating, ideas and opinions shared are my own. 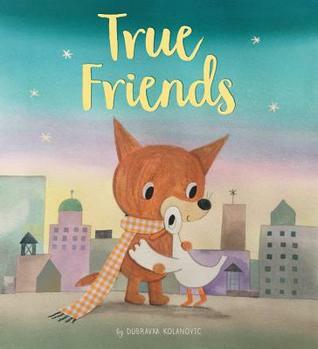 True Friends is a heartwarming story about true friendship and what you would do for a friend. When Fox meets Goose, she is very sad. It turns out she got separated from her flock and does not know where they have gone. Fox realizes that they have migrated and he assures her that he will get her back to her flock. How far will he go to make his friend happy and keep his promise. This is a story of an unlikely friendship between a fox and a goose. This would need a discussion about what is real and what is fiction. In this book the students will learn about various types of transportation, discussions about migration would also be an extension of the story. Of course the idea of helping one another and making friends feel better. I really liked the Illustrations in this book, they were adorable watercolour pictures. This story was very touching and heartwarming and it shows what a true friend will do to make you happy. A great book for family, classroom and school libraries. The publisher, QEB Publishing, generously provided me with a copy of this book upon my request. The rating, ideas and opinions are my own. 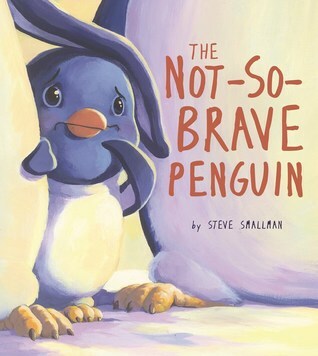 The Not-So-Brave Penguin, is another cute addition to the Storytime series. It follows two penguins, Percy who is a bit of a daredevil and Posy who is quite frightened of pretty much everything. Heights are hard for Posy, she doesn’t like sliding down the ice very fast like Percy does, she is afraid to jump into the water in case she belly flops, she doesn’t like snowstorms and she is very, very scared of the dark. One day, when a new iceberg floats close to their home Percy goes out for an adventure. Posy is to frightened to follow him on his fun adventure, but when he doesn’t return she is worried. Can she overcome her fear to help her friend? The artwork in this story is wonderful, definitely the sort that would keep a child engaged. Sweet watercolour illustrations that show emotion of the penguins very well. As with all the stories in this series, there are many ways a parent, caregiver or teacher can go with this story. Learning about penguins, where they live, how they move etc. would be one direction, but the one I really like is the idea of being brave. I remember hearing about soldiers saying that it is normal to be afraid of war and battle, but the brave person will face and overcome those fears to do what they need to do. That is a bit dramatic, but that is the message in this story. Once again the activities at the end of the book help to extend what the reader or listener hear in the story. This is one that my granddaughter especially loved, penguins of course. I definitely recommend this story to families, teachers and librarians. A great addition to any character trait collection. The publisher, QEB Publishing, generously provided me with a copy of this book upon request. The rating, ideas and opinions shared are my own. I always love when you review picture books. These three look fantastic. I love the art of all three, but The Prettiest Flower just feels so light and fun. I think I’ll try checking out all of these. Thanks Christopher. I say I do it for my grandchildren, but I really love reading children’s books. The illustrations alone in these ones are worth a look. I totally understand! I still love diving into children’s books. It’s just amazing what authors/illustrators can pack into so few pages. Thanks Jen, they were good ones. I am loving the weather. I need to post an update, maybe on Monday about my lovely trip south. I’ll watch for it! Glad everything is going well. These all look and sound too-too adorable!! Thank you for sharing them with us! You’re welcome. I enjoyed them very much. Such great reviews! Now I am homesick for my classroom. I love all of your ideas about how to use the books with kids. That is the way I love to teach, and the way I think children learn to love learning. The illustration on the cover of the penguin book is adorable! Not-So-Brave Penguin is still available on NetGalley for immediate access. Yay! Thanks Linda. One of the things I loved when I was a teacher librarian was when a teacher asked for books to teach ….. I could pull some that they didn’t even think of and they usually worked. I can tell you were wonderful at your “job” which you obviously loved. Wish we could have worked together, but now we get to enjoy blogging together. You have inspired me to get back to my original blogging purpose and review more children’s books than I have lately. Thanks Linda. I love sharing books with you. Your reviews are always insightful. I look forward to seeing what children’s books you highlight. The Prettiest Flower sounds absolutely wonderful! The hedgehog alone would have sold me, but the content sounds excellent as well. I have the Penguin book, but am so behind that I haven’t gotten to it yet. Really looking forward to it now! These were some good ones to use in schools or when families read and learn together. Illustrations are so cute.